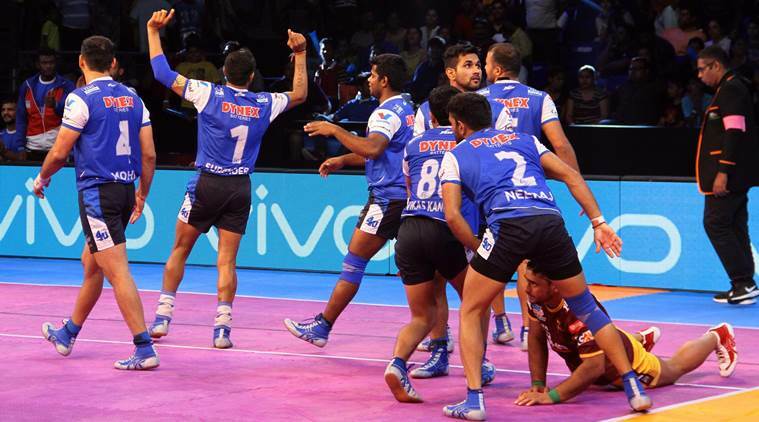 On the seventh day of Pro Kabaddi League 2018, Telugu Titans had clashed with U.P. Yoddha. As we know this was the second match of Telugu Titans, Titans won their first match of the tournament so they were here with competitive sports spirit in Sonepat leg. U.P. Yoddha won their first match and lost the second match, so Yoddha’s were in the mood of a comeback. Telugu Titans won the toss and chose the choice of court, U.P. Yoddha raid first. Titans’ Rahul Chaudhri took a bonus point in his first raid and Telugu opened their account. First 3 minute three points, it was like a quick recharge. Yoddha also saw their power but with less speed. After 15 Minute scores were 9-8, Yoddha was chasing Telugu Titans. At halftime, Telugu Titans led with 5 points with score 18-13. After halftime, Yoddha looked like decreasing lead which Titan set. One minute before the score was 31-29, but Titans’ Rahul Chaudhari who scored the first point got 3 points in super raid and score on the table was 34-29. Telugu Titans won their second match and Yoddha with 1 win and 2 lost. 2nd match of the day: Haryana Steelers vs U Mumba. Both teams won only one match in their last two matches, U Mumba had tied and Haryana lost their first one. Haryana Steelers won the toss and selected choice of court. With two successful raids by Siddharth Desai and one Abhishek Singh, U Mumba with 6 point lead score on table 2-8. Mumbai first all out before 10 minutes of the match. Super tackle for Haryana Steelers. After 17 minutes Mumbai once again all out. As Haryana Steelers lost their first review and at halftime, U Mumba was leading the match with 12 points with the score on table 15-27. It looked like big score match as U Mumba came u-p with successful raid and points. After an official timeout, U Mumba leads the match with 23 points and score on the table 18-41. 4 time all out! A lead with 27 points, it was the fantastic match of Pro Kabaddi league 2018. U Mumba scored 26-53 against Haryana Steelers.